Keeping a busload of kids under control can sometimes be the most daunting part of the field trip. To keep the noise level down and everyone entertained, play these five games on your next field trip. I’m Going on a Field Trip. It is a fun way to practice the alphabet. Have students brainstorm items to bring on their “field trip” that start with the letters of the alphabet. Starting with the letter A, choose a student to mention what they would bring with them that starts with the letter A, for example, apples, an anteater, or an anchor. Then choose another student to name an item that starts with the letter B, and so on. Two Truths and a Tale. This game works best with small groups of students sitting near each other and is a great way for students to get to know each other. Tell one student to make three statements about themselves – one is a true statement and the other two are made up. For example, “I have five cats at home,“ or “My mom is a spy.” The other students in the group vote on which statement is true. The Name Game. This game will challenge students’ memories. One student says a person’s name that starts with the letter A. Then another student repeats that name and adds a name that begins with the letter B. The next student repeats both names and adds a name that starts with the letter C, for example, Anna, Bailey, Curtis. The game continues with students adding names that begin with the next letter in the alphabet. When a student can’t recall the list of names the game ends or starts over. Yes or No Questions. One student chooses a person from history, a famous person, or an interesting place or item, while the rest of the kids on the bus or in the group asks Yes or No questions about the person, place, or object. Window Scavenger Hunt. This is an oldie, but a goodie. 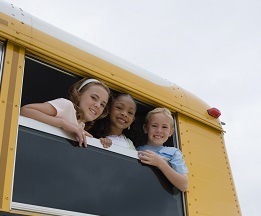 Have students work in pairs to find items commonly found on the way to your field trip location. Prepare a list ahead of time that students can use to check off items they see. Include one challenging item that will be a bonus for students to find.